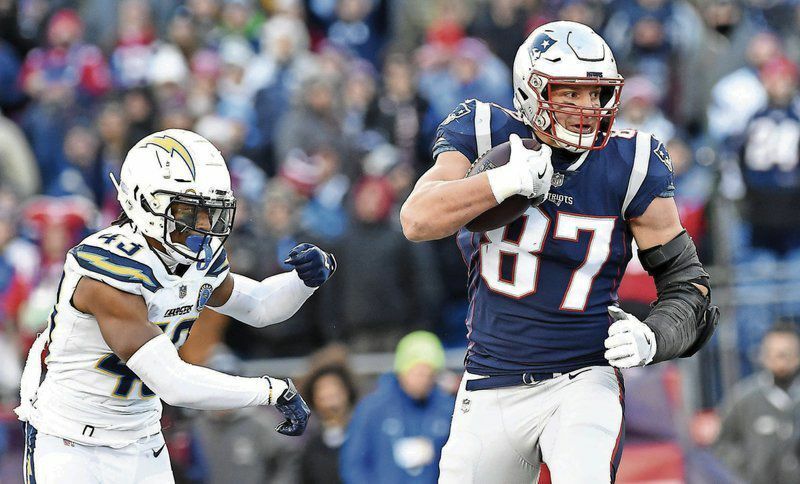 New England Patriots tight end Rob Gronkowski (87) breaks away from Los Angeles Chargers cornerback Michael Davis (43) during the third quarter of the Divisional AFC playoff game at Gillette Stadium. It was Gronk’s only catch of the day. 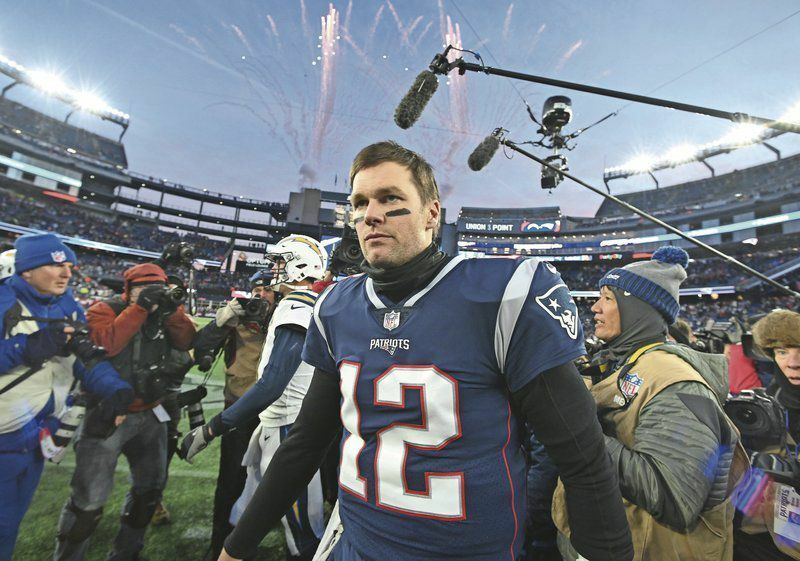 PAUL BILODEAU/Staff photosNew England Patriots quarterback Tom Brady leaves the field after throwing for 343 yards in a dominant victory over the LA Chargers on Sunday. PAUL BILODEAU/Staff photosNew England Patriots head coach Bill Belichick calling plays from the sidelines of Sunday’s playoff game against the Los Angeles Chargers at Gillette Stadium. FOXBOROUGH — Tom Brady and Sony Michel did their jobs Sunday at Gillette Stadium. Exceedingly well, I might add. In fact, there are others that belong on that short list, as in: Whoever blocked Joey Bosa and Melvin Ingram get “A-pluses,” and the Patriots defensive backfield, too, other than one hiccup in the first quarter. The New England Patriots embarrassed what we thought was a very good and tough L.A. Chargers, 41-28, to advance to their eighth straight American Football Conference championship. I hate to say it, but that is sort of like the Bruins’ old practice of putting up banners for division titles. That accomplishment, at least this week, is meaningless. The Patriots are on to Kansas City. “Come on, you have to let me celebrate this for one night, right?” said Rob Gronkowski, after a block-filled performance. OK ... time to move on. This is a different chore unlike anything the Patriots have faced and conquered this fall and early winter. Arrowhead Stadium is a place of horrors for many teams, but especially the Patriots. The last time the Pats were nationally written off was after that Monday night debacle in 2014, a 41-14 drubbing, to drop to 2-2. That’s where “We’re on to Cincinnati” was born and where a Patriots beat writer asked Bill Belichick if Brady would be replaced by Jimmy Garoppolo. The writer didn’t get an answer, only the Belichick glare. The 2018 Chiefs are as close to a very good or great team that they’ve had in Kansas City. They have the best record in the conference, at 12-4, and they are electric on offense. And we know the Pats’ performances on the road of this particular team. That’s where Belichick comes in. Throw out what Brady, Michel and even Belichick did at Gillette Stadium early Sunday afternoon, which was basically a carbon copy of what they did two weeks earlier against the Jets. The Chiefs have a legitimate star quarterback in Patrick Mahomes, a wide receiver in Tyreke Hill that gave the Patriots fits unlike any wide receiver in the Belichick Era with 14 receptions, 275 yards and four TDs over two games in 2017 and 2018, and head coach Andy Reid, who is in his 20th season as head coach. As good as the Patriots played against the Chargers, it won’t be good enough to beat the Chiefs. The Patriots were 3-5 on the road this season, with three of those being never-in-it type games. “That doesn’t matter,” said playoff neophyte Jason McCourty, playing in his first AFC title game versus eight straight for his twin brother, Devin. While the schedule says the Patriots have six days to get ready for the Chiefs and Arrowhead, I’m guessing Belichick has had somebody focused on these guys a few weeks longer, searching for tendencies. Brady & Co. playing mistake-free football probably won’t be enough. Belichick will have to scheme at an elite level to pull this off. But guess what? He has ... several times ... like the Super Bowl wins over the Bills (1991) and Rams (2002) or the AFC title wins over the Steelers (2002) and Colts (2004). Belichick’s defensive game plan for when the Giants stunned the favored Bills, 20-19, is on display at the Pro Football Hall of Fame. A Kansas City Chiefs fan Website asked fans over the last week which team they preferred to play in the AFC title game, the Patriots or Chargers. They wanted the Patriots. They might be right. Or, they might be wrong. While the guys on the field will make the plays, the Patriots may need more, like Belichick intervention. 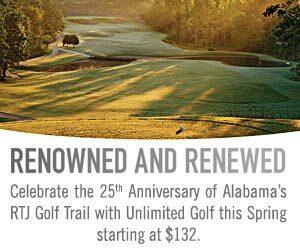 You can email Bill Burt at bburt@eagletribune.com.